My blog gets 400-500 page views a day. My web site gets about 1300 visits/day with over 4000 page views/day. The blog is not included in that. Probably a lot of those are search engines. Googlebot alone was responsible for over 50,000 hits in October. I have no idea how many total page views this blog has had. Since May 2009 it has had over 200,000 page views. 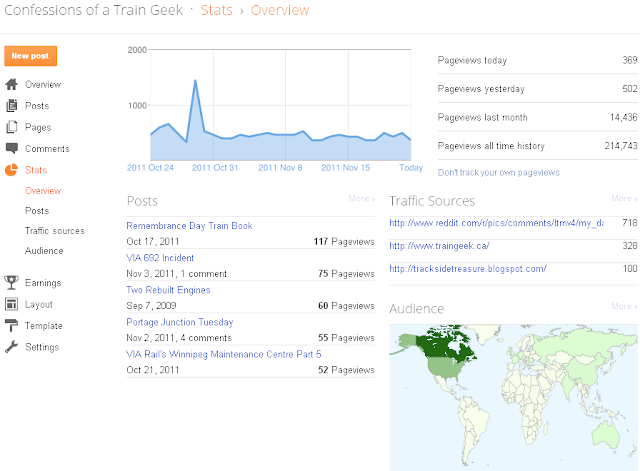 From May 2005 to May 2009 I hosted it myself, so the page views were not tracked by Blogger. My photo gallery passed half a million views a little while ago, and currently contains 2271 items in 121 albums. 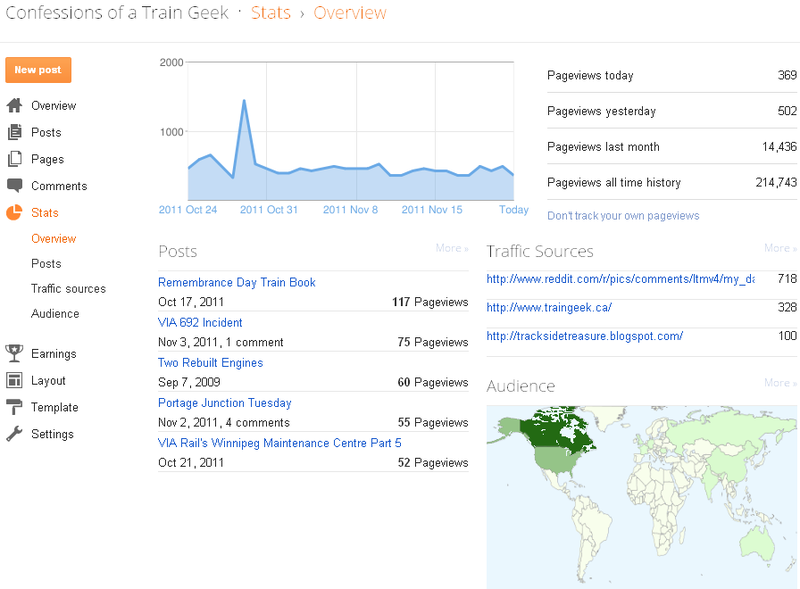 My blog got 724 hits from a Reddit posting (about CN 6534). You never know where the traffic is going to come from. For example, I had 42 hits from people searching for handlebar mustaches. I get substantial referrals from fellow bloggers like Eric at Trackside Treasure, Robert at Oil-Electric and Adam at The Walker Express. Blogger says I have 95 followers, which is awesome. Even creaky old Feedburner says I have 23 subscribers. Truly I have no idea how many people actually read this, except to say I'm always surprised by who reads it. I appreciate you all. Thanks for reading. Steve, back at ya - you're a very large referrer to Trackside Treasure. It's interesting to look at the stats as you have - blogpatrol that I used was sporadic and for sale in the summer, and I've reverted to the Blogger stats, for what they're worth. With a now-established blog, I don't always notice the number of visitors anymore, although I do enjoy comments and commenting. Keep up the great work on Confessions, Steve!